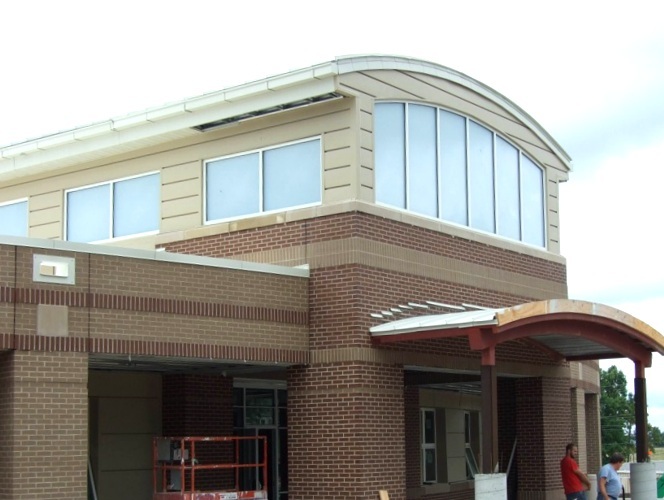 Richardsville Elementary, a new LEED Platinum School in Kentucky, is getting extra credit by being the first zero energy school in the nation! Opening this month to much anticipation, the facility is a cornucopia of green building strategies and efficient technologies. The bread and butter of the school’s success are tremendous efficiency gains coupled with a 300 kW thin-film solar array. Sherman Carter Barnhart Architects have done and astonishing job of reducing the building’s energy consumption to one fourth of a typical school without breaking the bank. 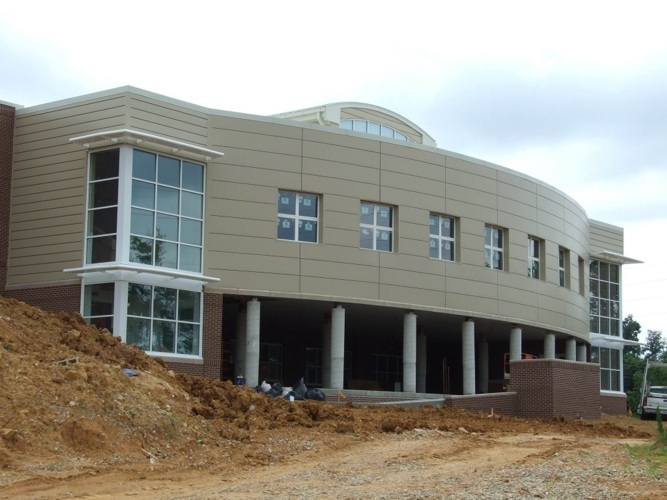 The 72,000 square-foot school uses insulating concrete forms (ICF) with a highly insulated roof to reduce reliance upon heating and cooling equipment. The windows are shaded by light shelves that reflect sun into the celestry windows, providing ample daylighting. Nanogel translucent panels line the celestry window in the main hall. Their ability to provide lots of glare free daylight is paired with super-insulated performance. A ground-source heat-pump helps provide for the building’s heating and cooling needs, and exposed pipes, meters and a floor motif teach the students about the system. In fact, each hallway showcases an environmental theme or technology — solar panels, heat pumps, recycling, and water conservation. The energy production comes from a huge thin film solar array that is glued to the roof top. The array was chosen for its simplified installation and because it could easily conform to the radius of the roof. Green construction materials used include a bamboo floor in the gym and reused building materials from the deconstructed school that was replaced. The kitchen uses new technologies that eliminate the need for a hood. The entire project breaks down to less than $200 a square foot, proving that great design and green building don’t require a huge cost burden. In fact, with all said and done, this could be the cheapest school to run in America! This is a great story! We just finished building the Pacific Ridge School in Carlsbad, CA which is seeking LEED for Schools Gold Certification from the USGBC. 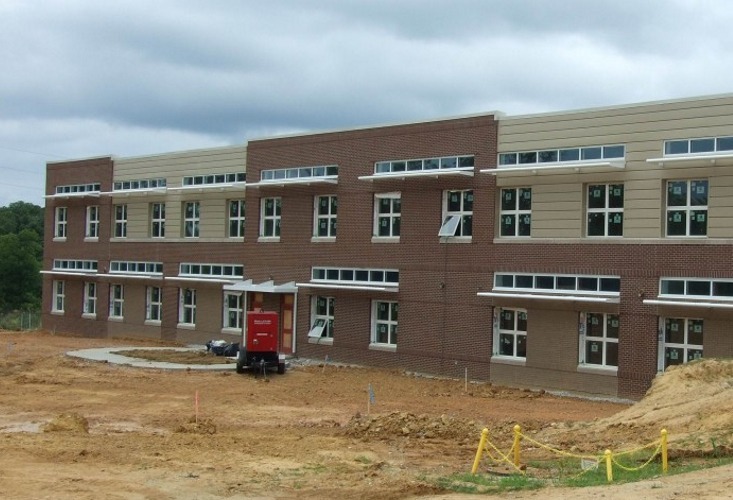 Richardsville Elementary, a new LEED Platinum School in Kentucky, is getting extra credit by being the first zero energy school in the nation! Opening this month to much anticipation, the facility is a cornucopia of green building strategies and efficient technologies. The bread and butter of the school’s success are tremendous efficiency gains coupled with a 300 kW thin-film solar array. Sherman Carter Barnhart Architects have done and astonishing job of reducing the building's energy consumption to one fourth of a typical school without breaking the bank.